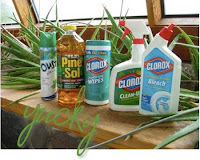 Thrifty Tip #13: Skip the expensive (often toxic) household cleaners and go with simple homemade cleaners. After Carson developed some asthmatic tendencies, we decided to clear our house of all harsh toxic cleaning products. If the bleach and ammonia in cleaning products made our lungs burns, we could only imagine what it was doing to poor Carson! At first, I bought 99 cent spray bottles and just used vinegar, water and baking soda. These things are so incredibly cheap and provide very basic cleaning solutions. The vinegar works awesome on windows and the baking soda works well on things that need scrubbed like sinks and tubs. Now I've branched out a little and like to experiment with other natural cleaners. Lemons can be amazingly helpful! Who knew? If you google "all-natural cleaners" you will literally come up with hundreds of sites and ideas. Sometimes I will get pretty specific in my search and it's amazing what solutions people have for every cleaning need! Here are brilliant ideas for 66 all-natural cleaners. Want to find out a few other uses for bread, ketchup or rice? Try these unexpected natural cleaners. What's your favorite all-natural cleaner? I would love to try the all natural methods... I'm convinced its better - thanks for reminding me. I really like the cleansers that are made by 7th Generation and Method...Target carries them, I think. They smell great, and make me feel like I'm not using poison to clean. Not that I've done any actual research to determine this, mind you. Just hopeful thinking. But those are more expensive than vinegar and baking soda, which I still use at times. I'll check your links for more ideas!